RUSH: Here’s Emily in San Francisco. Hey, Emily. It’s nice to have you on the Rush Limbaugh program. Hello. CALLER: Thanks. I listen to you every day. It’s something to look forward to, especially on a Monday morning. It was a terrific show yesterday. RUSH: Thank you. Thank you very much. What about today’s? I think we’re off to a pretty roaring start today. CALLER: Oh, yes. There are so many topics to talk about. For example, I wanted to talk about the fact that the Clintons want to take credit for the nineties, for the ‘great economy,’ which today is the greatest boom in the world we’ve ever seen in history. All the countries in the world are booming. It’s incredible how they took credit for the nineties when it wasn’t until 1994, November of 1994 that everything changed because a Republican legislature came in. 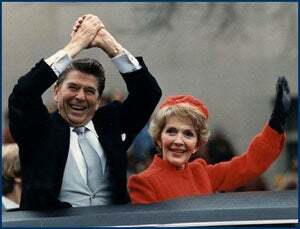 RUSH: Actually, to be thorough and honest about this, if there hadn’t been Ronald Reagan in the 1980s, then the nineties wouldn’t have happened and whatever the Republican Congress did in ’94 would not have been as successful because their starting point would have been much different. So you really gotta go back to the eighties and the drastic, the drastic reduction in marginal tax rates which spurred the economy. They had some glitches. The real estate market had some problems because they did change tax codes and behaviors and so forth. When that ironed out, it was ‘Katie, bar the door.’ We are still experiencing the boom of the eighties to this day. CALLER: Exactly. The thing is, though, as President Bush was saying on Saturday, he hopes to balance the budget in five years, within five years. However, the Democrats, almost like blackmail, they have to put in a $22 billion, you know, just overspending in order to ruin it, because within five years, the president explained, that $22 billion could add up to close to a quarter of a trillion dollars just in their overspending. So they are the tax-and-spend bunch. We put them in as a president, you get someone like Hillary, and then you get at Congress filled with Democrats that are left-wing. It’s no longer the Democrat Party we knew of the Kennedys. We now have a left-wing party. RUSH: They do, Emily. They have the left-wing party. We don’t. In fact, since you mention that, two things. This business of balancing the budget in five years? I remember the nineties. A balanced budget was a big deal, but I remember Clinton saying (impression), ‘Well, we could balance in two years, do it in five. We could do it in ten years.’ It wasn’t a priority. I’ve been hearing this so much. I’m 56. I am a seasoned adult now. I’m not yet a seasoned citizen, but I’m a seasoned adult and I’ve been hearing about all these financial crises my whole life. ‘The national debt! Why, it’s going to wipe us out! Why, the deficit is going to wipe us out. The budget is not balanced!’ Well, I look around, and for how long have I been paying attention? I started paying attention when I was twelve years old, so over 40 years here, and all these predictions of collapse and doom and gloom, and they happen every year, and they happen every day, and some of them recycle. The deficit’s going to wipe us out. The national debt’s going to wipe us out. The ChiComs holding so much of our foreign debt — and it never happens. We just keep roaring right along. My advice is: don’t panic. Don’t let ’em put you into panic. As for the Democrats and overspending, they are tax and spend party. They’re redistributionists. They want to control you. They want to control as many people’s lives as they can.